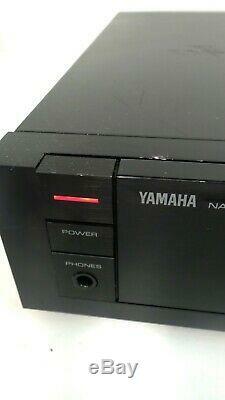 YAMAHA C-60 - NATURAL SOUND CONTROL AMPLIFIER in GREAT SHAPE. There are some light nics on the front face (see pics) with the worst scratches on the top-left of the amp. By no means does it effect the amp. Please see photos as they were just taken, if you have questions please ask. Total harmonic distortion: 0.001%. Channel separation: 85dB (MM), 85dB (line). Bass and treble (each with adjustable turnover frequency), - Stereo/mono mode, - Off/15Hz subsonic filter, - Record-output selection, Visible controls on front include- tone bypass, mute, tuner, digital audio disc, phono, tape 1&2, aux, volume, loudness. Frequency response: 10Hz to 100kHz. Input sensitivity: 0.1mV (MC), 2.5mV (MM), 150mV (line). Signal to noise ratio: 80dB (MC), 83dB (MM), 103dB (line). Output: 150mV (line), 1.5V (Pre out). Dimensions: 435 x 95 x 380mm. The item "YAMAHA C-60 NATURAL SOUND CONTROL AMPLIFIER CLEAN from 1984" is in sale since Tuesday, April 2, 2019. This item is in the category "Consumer Electronics\TV, Video & Home Audio\Home Audio\Receivers & Amplifiers\Amplifiers & Preamps". The seller is "mistermoneyappleton" and is located in Appleton, Wisconsin.